Straddling a small corner of Spain and France in a land that is marked on no maps except their own, the Basques are a puzzling contradiction—they are Europe's oldest nation without ever having been a country. No one has ever been able to determine their origins, and even the Basques' language, Euskera—the most ancient in Europe—is related to none other on earth. For centuries, their influence has been felt in nearly every realm, from religion to sports to commerce. Even today, the Basques are enjoying what may be the most important cultural renaissance in their long existence, as displayed by new cookbooks like chefs Alexandra Raij and Eder Montero's The Basque Book and restaurateur Jose Pizarro’s Basque. Mark Kurlansky's passion for the Basque people and his exuberant eye for detail shine throughout this fascinating book. 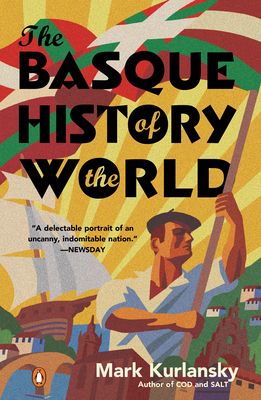 Like Cod, The Basque History of the World, blends human stories with economic, political, literary, and culinary history into a rich and heroic tale. Mark Kurlansky is the New York Times bestselling author of many books, including The Food of a Younger Land, Cod: A Biography of the Fish That Changed the World; Salt: A World History; 1968: The Year That Rocked the World; and The Big Oyster: History on the Half Shell. He lives in New York City.